APRIL 30: 6TH HOUR & CATECHISM – 11:00 AM. 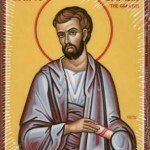 James, son of Zebedee was one of the Twelve Apostles of Jesus and was brother of John the Apostle. He is also called James the Greater or James the Great to distinguish him from James, son of Alphaeus and James the Just. 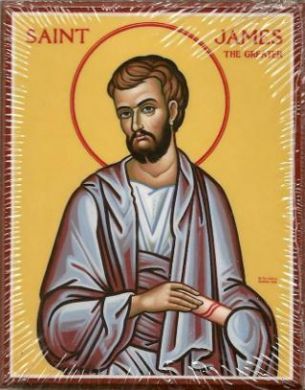 James is described as one of the first disciples to join Jesus and was one of only three apostles whom Jesus selected to bear witness to his Transfiguration. The Acts of the Apostles records that “Herod the king” had James executed by sword. He is the only apostle whose martyrdom is recorded in the New Testament. He is, thus, traditionally believed to be the first of the twelve apostles martyred for his faith.